This is part of the Book of Me, Written by You series. This week Julie Goucher has asked us to write about Halloween, whether we celebrated it, and the costumes we wore. 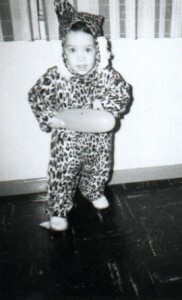 This is me in 1967. I imagine this is the first Halloween I participated in. I was 3 years old. Halloween was a big deal with me and my siblings. My parents didn’t have a lot of money, but we never did without. We just did with less. No, I’m not going to go on about how we had to Trick or Treat in the snow or anything. Sometime in October, my parents would take the five of us to Woolworth’s. They had rows and rows of cheap Halloween costumes. You know the ones I’m talking about. The costume consisted of an apron/smock that you tied in the back and a plastic mask with eye and nose holes that never matched up. Honestly, we loved it! We just didn’t know that a person could spend $30-$50 on a Halloween costume (that’d be the next generation when all the kinds wanted a genuine Little Mermaid or Simba costume). We were thrilled with our plastic masks and smocks. We got to be pirates, Looney Toons characters, witches, vampires, and more! Who needed face paint, fancy princess dresses, and accessories? Costume buying was the most fun we had clothes shopping. I remember that one year I went as Tweety Bird and another year I was a witch. I remember in 3rd or 4th grade my best friend, Renee, and I went as sheet ghosts. I was a baseball player in 6th grade. I can remember how the anticipation grew as Halloween got closer. On the 31st, we got to wear our costumes to school. We had a school wide party with lots of goodies. We had a parade around the blacktop to show off our costumes to the parents and teachers. It was so much fun! They let us out early that day, so that families could prepare for Trick or Treating. When I was a child in the late 1960s and early 1970s, Trick or Treating was huge. Back then everyone except those who objected for religious reasons had their kids out going door to door. My Mom always stayed back to man the door, while my Dad took us around the neighborhood. I can remember barely eating dinner I was so excited. Then, we’d wait for it to be just dark enough to count as night. Boy, did we drive my Dad nuts! There was an elderly Japanese woman on our block, most likely the wealthiest person in our neighborhood. She gave out large Hershey bars to the first few kids (or so the rumor went), so that was extra incentive to be first. I can’t recall if I ever got one. We took Trick or Treating seriously. No puny pale or plastic bag for us. We carried pillow cases and we hoped they would be full by the end of the night. That bag got awfully heavy by the second or third block. On the way home, my Dad had to carry a bag or two. We were exhausted when we got home, but that didn’t stop us from pouring out our bags…in separate locations in the house so as not to have anything stolen. I pulled out all the crummy stuff and hid my favorites. I was particular to the wax harmonicas, Almond Joy bars, Ghirardelli Flicks, and Smarties. My oldest brother was a notorious candy thief. If you weren’t careful, your good stuff would be gone by morning. The rest of the candy went into these huge ceramic bowls that my Mom had. Everyone ate from those. That candy lasted us for weeks. My Mom let us put one or two pieces in our lunch pail for school. We savored it at lunch time. I am sure the teachers weren’t thrilled with all those kids hopped up on sugar. But, it was all in good fun. The last time I went Trick or Treating was 6th grade. After that, Halloween wasn’t that big of a thrill for me. As an adult, I don’t really care for dressing up in costumes. It’s really more for the kids. Now I enjoy my role seeing all the cute kids in their costumes and handing out candy. It’s not the event that it used to be. If we get 20 kids it’s considered a good night. It’s too bad. Halloween was meant for the little kids and Trick or Treating was part of the fun. I’m sorry to see it fade away.